The majority of customer interaction today happens on the phone, but that isn’t the way most customers prefer to communicate or the most effective way for brands to interact with customers. Phones can be frustrating, email can feel like spam, and in-person communication can be inconsistent. Instead, a growing number of brands are turning to chatbots via Facebook Messenger to add value to the customer experience in a way that is easier than ever and preferred by the companies and the customers. 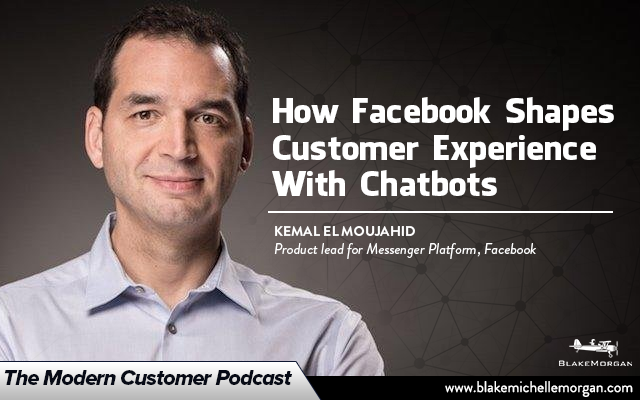 When Facebook opened the Messenger platform in 2016, it had a good idea of what the technology could do for companies, but Kemal El Moujahid, product manager at Facebook, said the team was surprised by the creativity of how brands around the world were using the chatbot function. Instead of relying on traditional methods like blanket sales offers and mass communication, bots provide opportunities for real-time, personalized communication that can meet the needs of customers right where they are. Brands can easily tailor the needs of the bot to showcase their message and products and reach out to customers in an accessible and useful way. In order to be successful in building the customer experience, brands need to be clear about what they want their bots to do. A bot that is designed to bring customers into the store will perform differently than a bot that is designed to provide product recommendations and education. Brands need to understand how customers are using the bot and how it can play the most effective role in the customer journey. An example of this comes from Sephora, which uses its Facebook bot to educate its customers about its products and offerings—its bot can provide personalized makeup recommendations and allows customers to find stores and book beauty treatments. Sephora’s customers have a much better experience when they understand the products they are looking for, which is where the bot can help. Because bot communication is more natural and casual, it adds a personal feel to a brand and helps create a life-long relationship between the customer and the business throughout the entire customer journey. Bots can be used to bring in new customers and to build on existing relationships. McDonalds restaurants in Brazil print codes that link to their Facebook bot—when customers access the bot, they get added benefits and build a stronger relationship with the brand that gets them to come back to the store. A huge draw for bots is their convenience. Instead of having to download a new app or program, bots are instantly available to the millions of users already connected to Facebook Messenger around the world. Bots can be developed and updated fairly quickly and inexpensively, which means companies can make changes to quickly best meet the needs of their customers. As the customer journey evolves, so too can the bot’s performance. Bots will continue to play a major role as the customer experience grows and becomes more personalized. Bots gather lots of information to distill it down to the most relevant information for customers, allowing for better personalization at scale. The days of spending hours on the phone to answer questions are done—today’s customers are all about using bots for questions, service, and product information. As brands around the world can attest, Facebook makes it easier than ever to build customer relationships via bots. Blake Morgan is a customer experience futurist, author of More Is More, and keynote speaker. Sign up for her weekly newsletter here.